1. Strips glued up like a normal cutting board (I apologize for not having pictures before I cut the angles). 2. Table saw setup for cutting the angled strips. 3. When cutting the angled pieces, two large triangles will be removed. 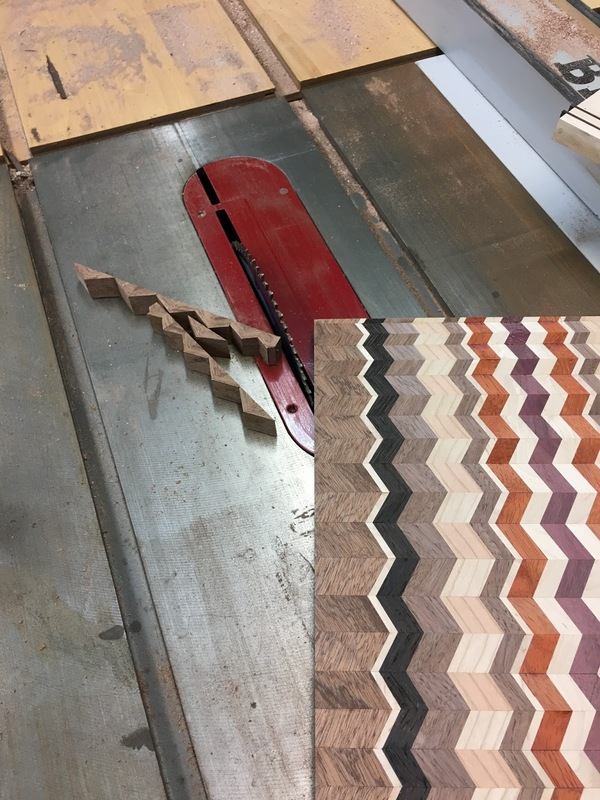 After completing my first “chevron”-styled cutting board, I had many people asking me how I was able to make it. Did I have to glue hundreds of little pieces together? 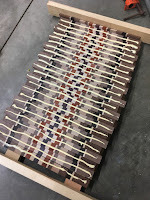 Though the process seemed simple to me—cutting and gluing strips in two steps—it was hard to comprehend for others. 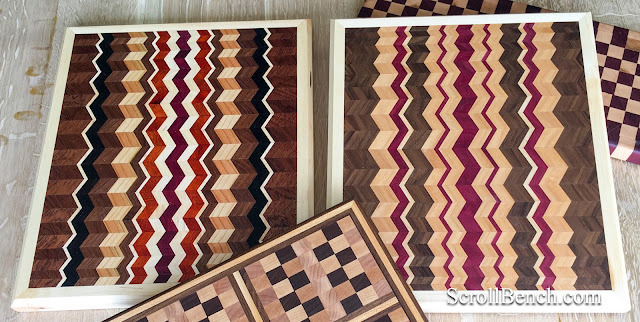 With the general misunderstanding among so many that don’t have backgrounds in woodworking, I figured there may also be some aspiring woodworkers, and even professionals, that wouldn’t intuitively know how to go about making chevron-style cutting boards. 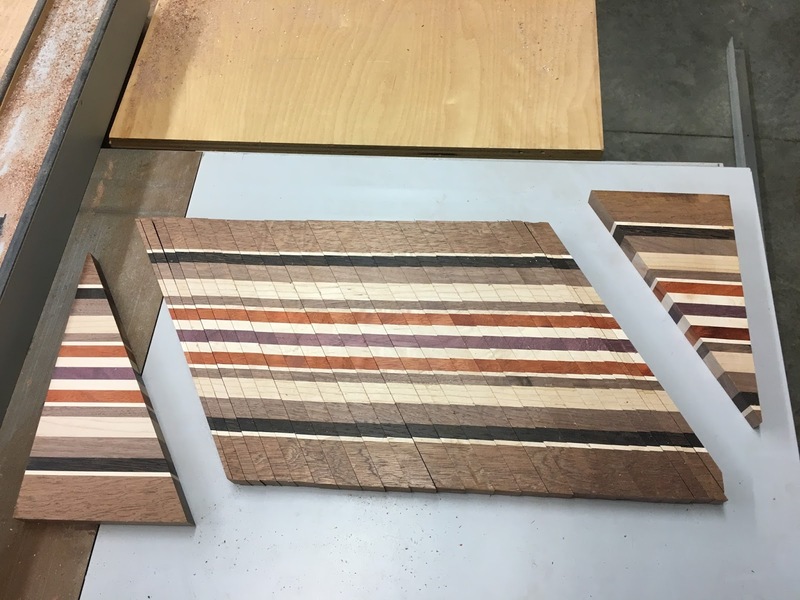 With this post, I’ve tried to put together somewhat of a how-to for making these cutting boards. The first step for making one of these boards is understanding and planning for the final size of the cutting board you desire. Quite a bit of material will be lost in all of the sawing, especially cutting at angles. For reference, I glued up strips into a plank that was 12” wide and 24” long. My final cutting board, with maple trim around the edges, was about 12” x 16”. 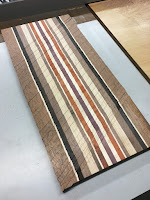 For the board depicted in this tutorial, I used six types of wood: jatoba, maple, wenge, walnut, padauk, and purpleheart. I also used a symmetrical design. 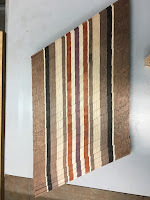 After lining up and gluing the strips together into a plank, as if I were making a simple striped cutting board, I planed down the resulting plank and ensured everything was still square. 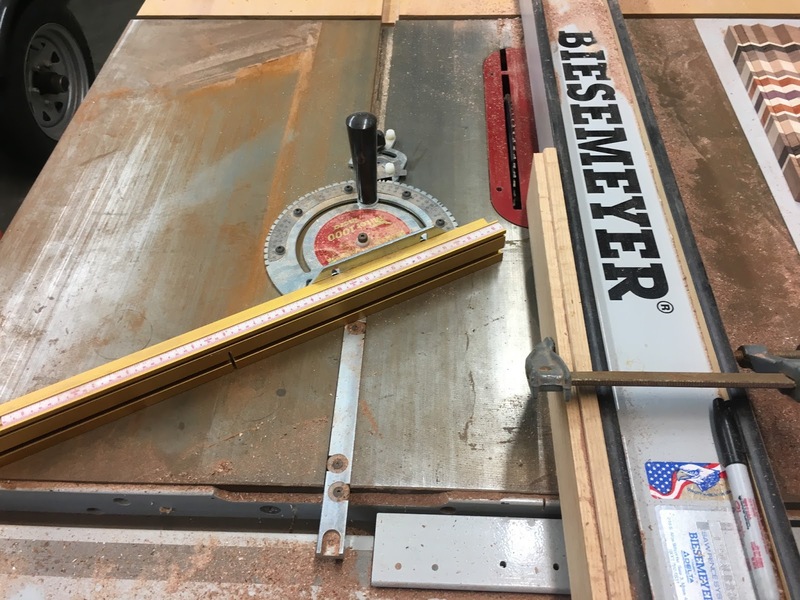 I then set my table saw miter gauge to 30˚. I chose that angle for the sole reason that it was the highest angle I could use and still fit my board between the saw blade and miter gauge without the miter gauge guide falling out of the table saw miter slot (I really wish I had an extension guide for my miter gauge). 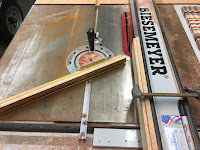 Because there was still some play in the miter gauge with so little of the guide in the miter slot, I actually used my miter gauge backwards so that more of the guide could be in the miter slot, resulting in no play and accurate cuts. I also clamped a stop block to my fence so that I could accurately determine the thickness of strips I was cutting, but not bind the strips between the fence and blade after being cut. Please never use both the miter gauge and rip fence without stop blocks; binding boards can create very dangerous situations. Once I had the table saw set up, I began cutting the angled strips. The first cut was to cut off the triangle end-piece. 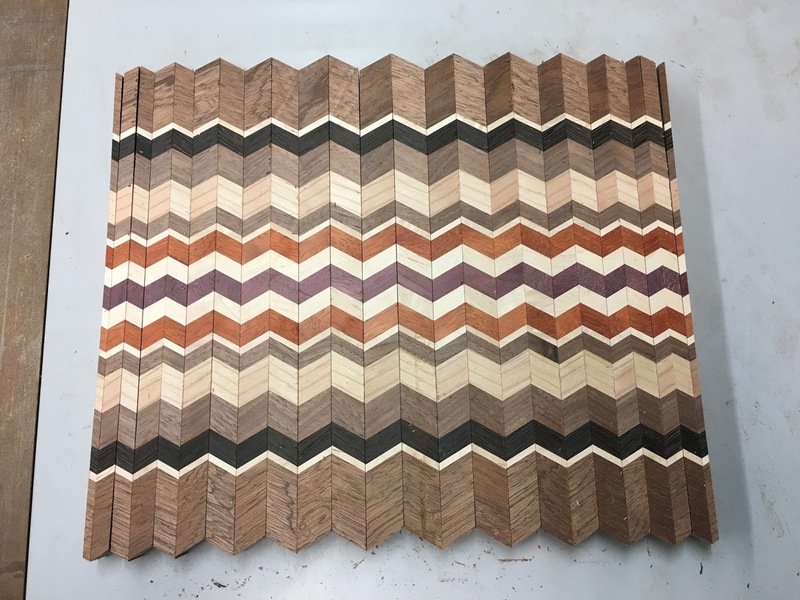 You have to have the full length of the angled cut to use for the final board, so two large triangles will go to waste (saved for other projects). 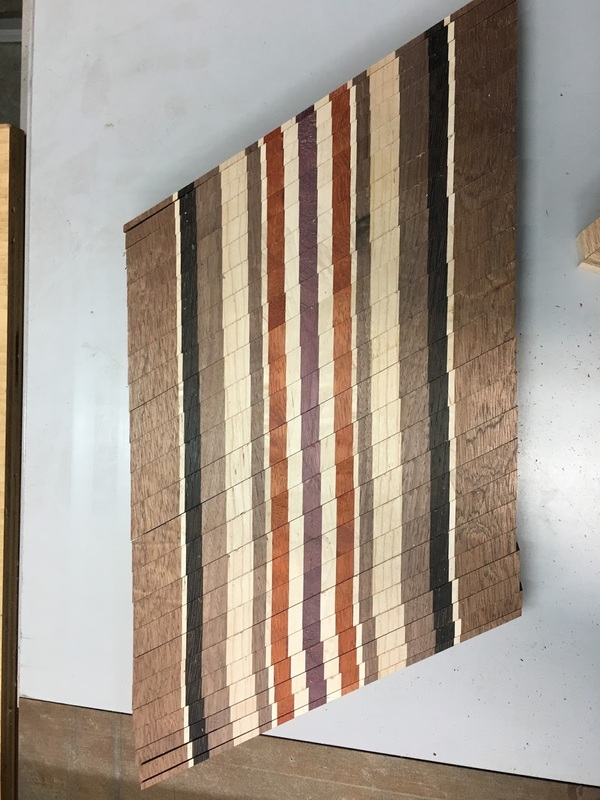 At this point, you could cut all of your strips the same size and have a very nice board. However, I decided to increase in strip width from the outer pieces leading inward. 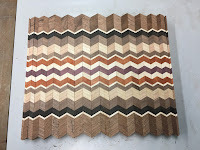 To do so, I cut 4 strips at 1/8” each. 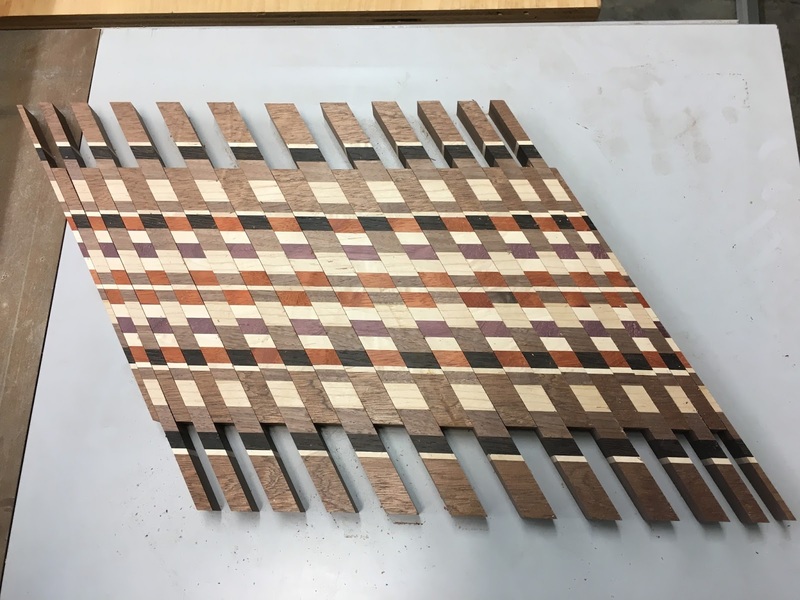 Two strips will be paired on the left and right sides of the board. 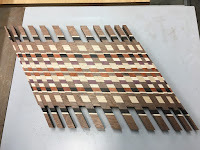 I then cut 4 strips at 1/4” each, again pairing them at each end. I continued to increase in 1/8” increments until I cut a pair of strips at 1” each for the center of the board. 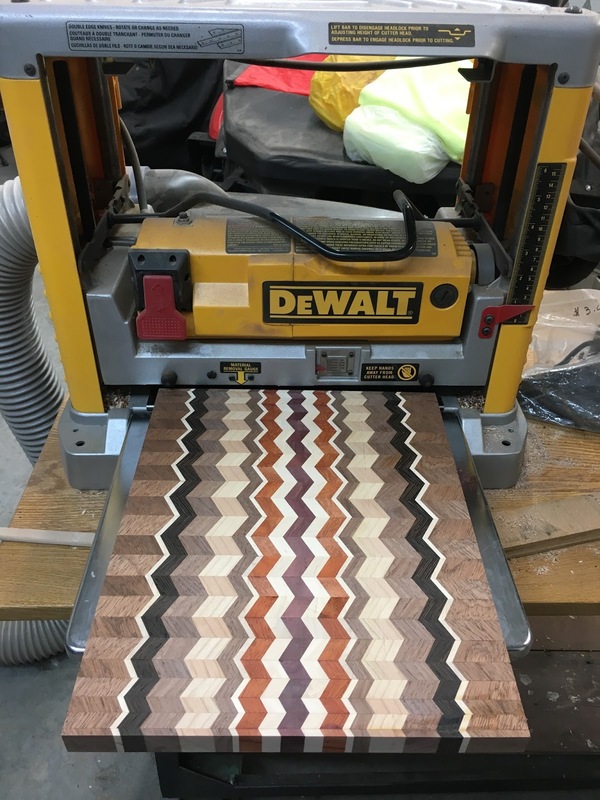 After having all of the angled strips cut, I took every other strip and flip it end over end long-ways, giving the chevron effect. I then re-glued the strips together and clamped overnight. The next day, I used my table saw to straighten the jagged sides of the board and to make sure everything was square again. I then planed it down, sanded it, and added 1” maple trim around the edges with a 1/4” chamfer (a sharp edge to match the sharp angles of the chevron pattern). Finally, I applied a mixture of pure beeswax and cutting board oil to seal the pores and provide a nice, food-safe finish. 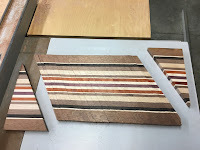 Overall, I think these boards stand out from typical glue-up cutting boards for only a few extra steps of work. If you have any other questions about how to make these, please don’t hesitate to ask. Also, as always, please share pictures of your finished products. We will share them on our site, with your consent, of course. this pic to the top). 6. Strips are then glued. 7. 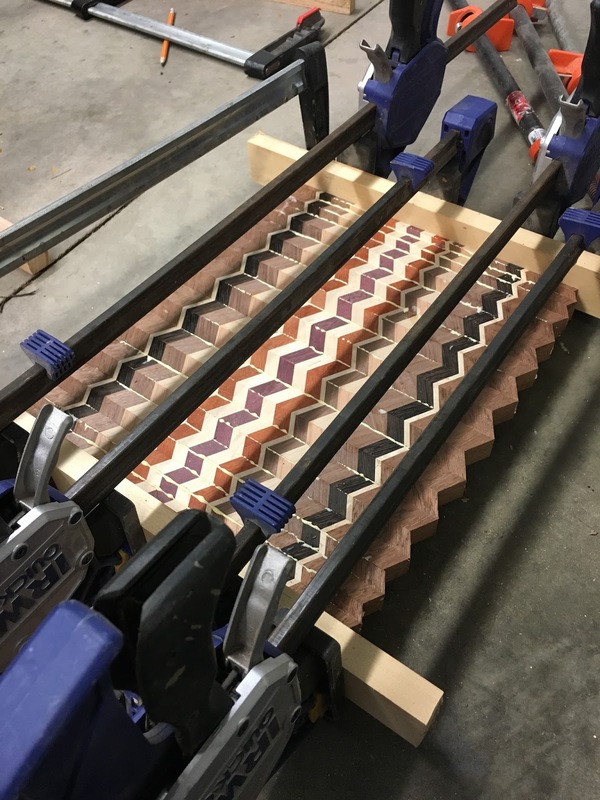 Strips are clamped overnight. every other strip and gluing. the sides of the board. Good for the price, but not great quality. Wood is thin and seems like it will warp easily. Channel isn't deep enough to be useful. Used the chopping board one time washed by hand then dried it by hand and it warped! Then I tried to use it warped and it broke in half! No good stay away….. I'm afraid you may be confused. We don't sell the cutting boards here, we only teach techniques and offer free patterns. Further, none of the patterns or techniques on this website have channels, and you may choose to create your cutting board out of any wood thickness you desire. I personally use 1" thickness, and after one year of use, it is like new.